The Smart Wool NTS Mid 250 Crewneck Baselayer Top will keep you warm, comfy and dry during long days on the mountain, all-day trail hikes and everything in between. Merino wool with just enough stretch lets you move freely and delivers natural warmth that breathes and dries quickly if you work up a sweat. Chafe-free seams are carefully placed and crafted to eliminate irritation from pack straps and protect sensitive skin. As comfy as your favorite tee, but with a lot more style, the NTS Mid 250 crew top will be your dependable favorite for all types of weather and activity. Excellent base layer that blew synthetic out of the water! I wore it to work, raking leaves, and on a winter hiking trip and was impressed with how comfortable (didn't even notice a scratch feel!) and how well the top wicked. I was pouring sweat during the hike and the shirt was dry in what felt like just a couple minutes. I was given one of these tops in 2012 and marveled at how warm/comfortable/perfectly amazing it was. That one was starting to lose its elbows, so I replaced it earlier this year. The new one has significantly longer sleeves and torso, which is strange. It pilled on the second wear and the fabric is scratchy and rough, like cheap wool. Nowhere near what this product once was, and not the quality I expect from Smartwool. Disappointing. My new favorite base layer! Let me preface this by saying that I love this product.. it is incredibly versatile. I have used it as a baselayer, a midlayer, and a sweatshirt. For travel this thing is unparalleled for its flexibility. Perfect weight, great colors, great product. However... I bought one, loved it, bought a second one. Between the two I washed, as per manufacturer's instructions, the first. The shrinkage... is epic. Inches in length, inches in width.. epic shrinkage. Because I wanted it to be able to fit over flannel shirts I bought this thing one size up, so even with the shrinkage it still fits comfortably as a base or midlayer... but be warned. If this fits in the store, buy the next size up in anticipation of shrinkage. My wife wear it for winter hiking. Excellent for keeping body warm and quick dry. Perfect for in between weather. Too form fitting for me. Mid section too tight. I love these tops. I can dress them up or wear them casually. I wear them with a necklace or a scarf. They wash and dry like a charm although my older ones I now hang to dry. This top is soft, warm, comfortable - exactly as I hoped it would be. I ordered a medium (125 lbs, 5 foot three, athletic build, swimmer shoulders) and it fit very well. I was a bit worried the shoulder/armpit area would be tight, but it is an exceedingly comfortable fit with a great range of mobility. I will definitely be wearing this snowboarding, hiking, shoveling snow, etc. So disappointed, either the cut is changed or the material, very sloppy and pilling. I have two they are so warm and comfy! I could wear them everyday! Great warmth on below zero hikes. Easy to double up. I wore this with just a t-shirt over it in 20 degree weather while briskly walking and I was warm enough without getting sweaty. The material is soft and lovely, and the cut is long enough that my slightly longer torso doesn't experience the gap. This is a warm and comfy long sleeved t-shirt that I will wear all winter. Great for layering with a puffy vest! This is such a great layer. The dark grey color especially looks really nice- I can use it as a cold weather baselayer and I also wore it to a Thanksgiving party. It can even be layered with a lighter weight smartwool base (like the 150) for a super cold weather base system. I have bought more than one of these and consider it an integral part of my winter layers. I would definitely recommend this top! I use it for hiking and sometimes around the house in the winter. This is the second one that I purchased.The first one was about 10 years ago, and it is still going strong. 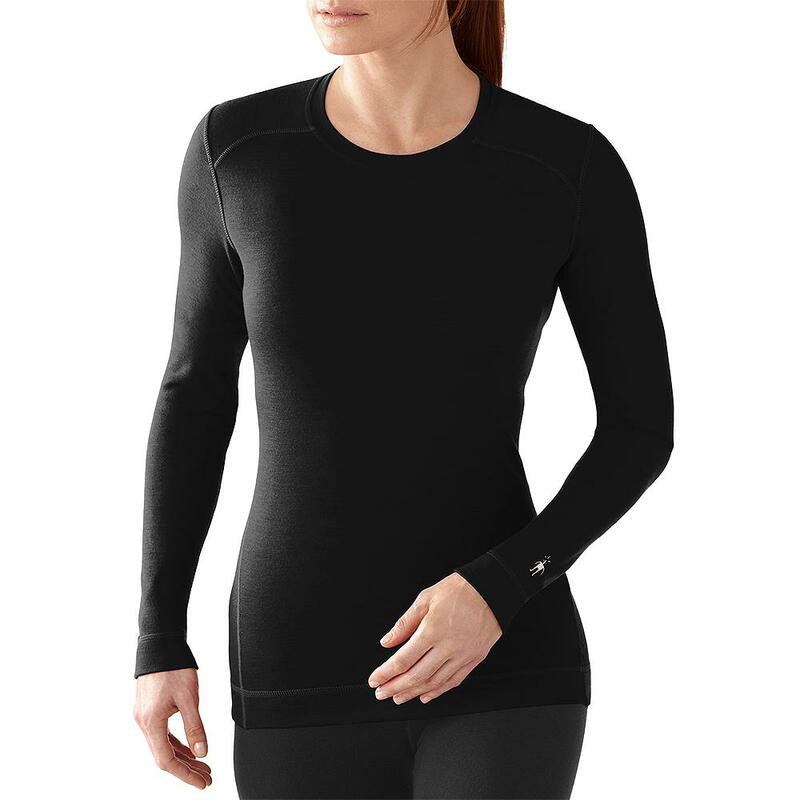 I absolutely love this smart wool base layer! I get cold very easily due to an auto immune condition, and use this base layer to keep me snug and warm in the winter time. It is so soft and durable. I have another base layer from smart wool that has lasted me 5 years so far. I can't thank you enough for making such a great product. It has helped me so much! Plain & Simple, Just what a baselayer should be! Wear it alone, with a vest, layered or under a blouse at the office! A solid all round piece that keeps you warm! So many color options, it can be hard to choose just one. I bought past season colors on sale at a different website and liked the 250's so much I wanted different colors. ( I only owned the 150 baselayers) I purchased this season color Blue Ice Heather. It is slightly light blue with a heavy heather grey. I prefer last season's deeper jeweled colors to this season's colors. For reference I'm 5'3, 106 lbs., 32A bust and an XS fits nicely...it is fitted, but better for layering, although for me it is still loose enough to wear by itself. The S was too loose in the torso and shoulders. Very comfortable. I'm happy with it all around. Love this shirt. I know it is meant to be a base layer, but I use it as a shirt during the autumn and winter. It is really comfortable -- stretchy, so never binds. And because it is wool, it is warm, but never too hot. I'd own 10 if they weren't so expensive. Washes great as well. Couldn't be happier. I cannot fully explain how much I love this shirt. It's flattering, warm, and the quality is out of this world. I bought it for a trek in Nepal that I have coming up soon, so I haven't worn it much yet. Looking forward to it! Great fit and very soft. Would like to buy more but they are very expensive.